Look what I made today....they're great with hot chocolate. Come on over, I'm waiting for you. Oh, wish I could have one. Okay, maybe two. 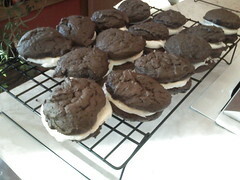 Why do they call it Whoopie Pies? Hi MM - I have no idea why they call them Whoopie Pies...perhaps when you eat them you go "WHOOPIE" I know they're not named after Whoopie Goldberg though. My tummy started to growl. I like that you have a flair for the "understated."